The Dutch maritime technology company Micanti has designed a 100% environmentally friendly antifouling foil. Its working is based on small fibers, which make it very unattractive for organisms to attach to the hull of a ship. The innovative nature of this invention and the successful launch of it within the global professional shipping industry has provided Micanti with the title of the SME Innovation Top 100. The SME Innovation Top 100 is the biggest and most prestigious innovation award of The Netherlands. 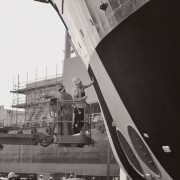 The Micanti Antifouling film was developed by Micanti’s founder Dr. Rik Breur. The millions of tiny fibers or hairs on the foil are resilient and vibrate constantly by the water movement. This combination of prickliness and swaying of the fibers makes the surface unattractive for organisms to settle. The nylon fibers are similar to the spiky hairs that organisms have to combat fouling. With Micanti Antifouling, it is possible to prevent all sorts of macro-growth (think of mussels, barnacles, algae) to from settling. The success of Micanti Antifouling film is easy to explain according to Micanti. With a lifespan of at least 5 years shipowners save a lot on time and cost, as a ship saves fuel because fouling stays away as does the need for coating. In addition, the antifouling foil works as the ship sails, but also when it is moored.